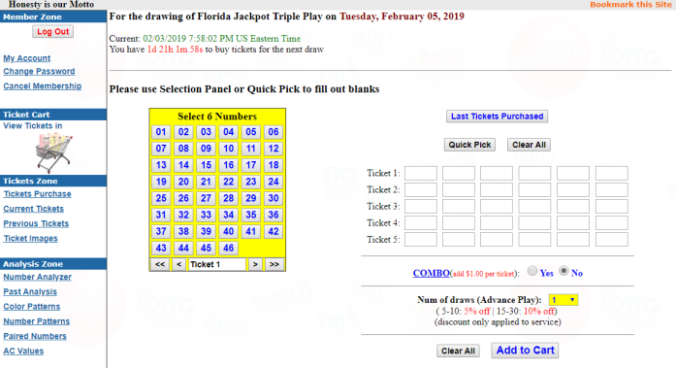 Florida Jackpot Triple Play started on Junaury 30, 2019, and is a replacement for Florida Lucky Money. The drawing is on every Tuesday and Friday night at 11:30 PM Eastern Time. Florida Jackpot Triple Play jackpots start at $500,000 and can roll over to up to $2 million if there isn't a jackpot winner. Once the Jackpot Triple Play jackpot reaches $2 million, the top prize pool rolls down and increases the payouts on all of the lower-tier prize levels. Go to Buy Tickets section, and Choose Florida Jackpot Triple Play. Select how many tickets you want to play. Select 6 numbers from 1 through 46 on Number Selection Panel. You may also use our Jackpot Triple Play wheeling system to wheel the numbers, and click Fill with Wheeling Numbers to fill out numbers in the Ticket Cart. Select how many times you want to play. You can play up to 30 times. We also have discount available on service charges for advance plays more than 5 times (10-25: 10% off | 30: 15% off). Fill out payment information, or use your account money (You may also use Paypal to deposit funds in My Account section). Double check all information in the form, then, submit your tickets.